Postcard From Plymouth, Circa 1970 Something? (206/365 v2.0) – Annoyingly Boring? We were out with the kids doing some back to school shopping and after lunch we headed down to the Plymouth waterfront. Took some photos of the Rock and the Mayflower II but wasn’t really pleased with anything I shot. To make up for it I processed the hell out of the photos. 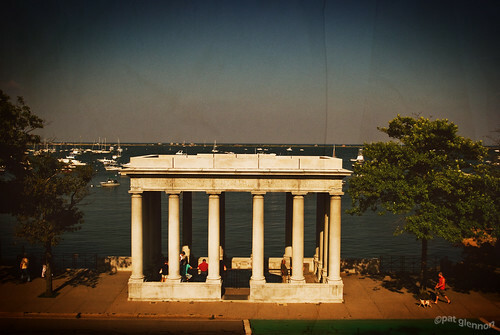 Gave this one of the Plymouth Rock portico an antiquey feel. It DOES look like an old postcard! very cool!! .-= Darr´s last blog ..Back from Florida! =-. .-= Rick Astley´s last blog ..First day… =-. .-= DCUrbanDad´s last blog ..There is still time to have your voice heard. Am I wus? =-.